Ideal for raised bed gardens - no soil mixing required! 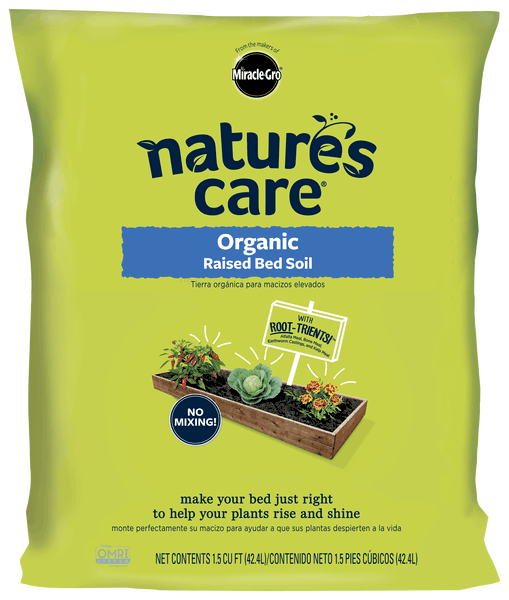 Ideal for raised bed gardens, Nature's Care® Organic Raised Bed Soil is specifically formulated with rich organic matter and high-quality nutrients that help give your fruits, veggies and flowers what they need with no mixing required. Make your bed just right to help your plants rise and shine. For a 4' X 4' Raised Bed, you'll need 8 bags. For a 4' X 8' Raised Bed, you'll need 16 bags. Watering Tips: While raised beds are like pots and drain out more quickly than the surrounding soil, you also don't want to overwater. Let the soil surface dry to about a half-inch deep between watering. The Dirt on Our Raised Bed Soil: This product is regionally formulated from (one or more of the following: peat, processed forest products, and/or compost), and (sphagnum peat moss and/or coir), poultry litter, alfalfa meal, bone meal, kelp meal and earthworm castings. For state-specific ingredients, see product label link at the bottom of this page.